The architectural concept proposed by Manuel Villa Architects in Bogotá and designed by Studio Cardenas Conscious Design in Milán –which also wrote the theme statement– has the stamp of innovation and sustainability. 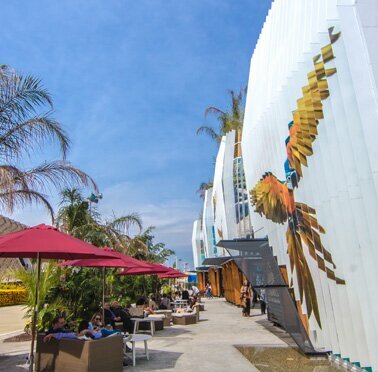 The design of the pavilion is inspired by the thermal floors, that's why the 1,907 m2 of the building are divided into four units that symbolize Colombia's mountains, that go from sea level to perennial snows. The façade is an allegory of the diversity that you would see in a trip across the country. The images of fauna and flora that decorate the exterior change depending on where do you look at them. 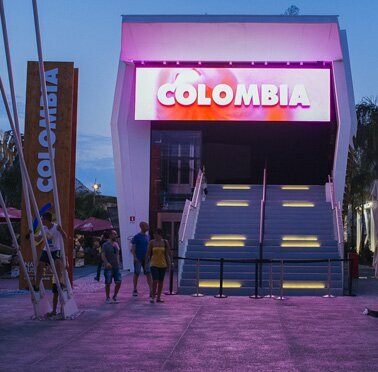 This dynamism is felt throughout the pavilion, which is decorated with flavors, aromas, textures and colors that demonstrate that Colombia is full of contrasts. 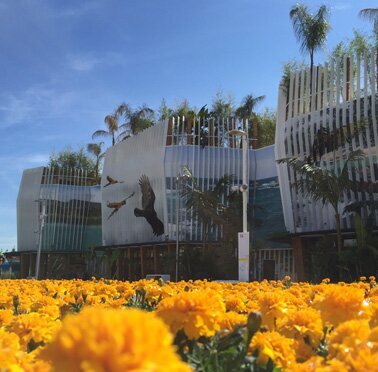 Macaws, frogs, butterflies and other species of Colombia's rich wildlife adorn the pavilion's perimeter. These species accompany six Colombian landscapes that show the beauty of rivers and lakes, the power of seas, the grandeur of deserts and the peacefulness of beaches found in the country. Being naturally sustainable is also one of the main goals of the design. Therefore it is built with spruce, one of the most used materials in environmentally friendly buildings. Laminated wood parts are brought from Friuli, one of the leading producers of wood in northern Italy; also they are lightweight and easy to assemble materials, allowing a more efficient transfer.